Shinobi... What can I say? One of the greatest platform games ever created. A true arcade classic and a definite addition to any SMS fan's library. Spawned dozens of sequels and spin-offs, including famed Shadow Dancer and next generation titles such as Shinobi (PS2) and Nightshade. Sorry Ryu Hayabusa. You're cool too but Joe Musashi (and his relatives) will be always our choice of ninjas. * = Please refrain from making "OVER NINE THOUSAAAAANNNDDD!!" jokes. Now, there is something you should know about this game: It was only released in Europe. This... could not be good sign. Do not get me wrong, there are many rough diamonds out there that never seen the light in US markets but in my experience, most of the time, these games would be disasters. Kind of stange when you think about it. Forget the US Markets, why was this game never released in Japan, the country it was created in? 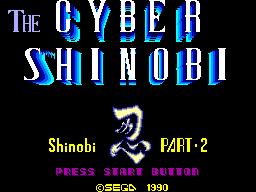 Anyway, Cyber Shinobi is again, a side scrolling platform game. You jump around, slash people, use your special weapons and of course, ninja magic. With a total of six levels, this game can hardly be considered long. But then again, this is an 8-bit game, so I'm not suprised. Joe has a lot of stuff that can help him. First, there are weapons. (SHOT) You have your good old shuriken's, Joe's cybernetic right arm which turns into a vulcan gun, (Space Adventure Cobra, anyone?) and finally a big nasty hand grenade that creates a small firestorm. Another trademark, you have your ninja magic. (NINJUTSU) Just like your weapons, you must gather enough magic energy to launch a powerful attack. They are all the same, a massive block of letters pass, telling you the name of the magic, (who came up with this idea anyway?) and it hits the all enemies on the screen. Pretty good for SMS standards. Good backgrounds, nice character animations. Interestingly, this is one of the few games that give attention to player characters choice of hand. He holds the sword with his right hand wherever he turns. Kinda like E-SWAT. I like those small details. But, there are some problems too. Take a good look to the screenshots... What do you see? Yes... The status bar. I'm not exaggerating, this is the largest status bar I've ever seen in my life. It's good to see so much detail but why does it take 30% percent of the screen? It's so big I almost feel like I could fall down and crush Joe anytime. Oh, and why do I have to see the gigantic letters whenever I cast a spell? It's not cool, just tires your eyes. Not much to say. Soundtrack is good. Opening and title music are good. Boss music is kind of catchy too. Sound effects are what you can expect from a SMS game. Not really groundbreaking but not annoying either. We have some problems here, unfortunately. First of all, your attack range is severely limited. Joe probably skipped some ninja-training sessions. He simply slashes his sword to 45 degrees to upwards. If you press and hold the Button 1, he makes a stronger slash which dishes out more damage but still short ranged. Your crouching kick has a little longer reach but it's too weak. Another problem we have is with jumping. He jumps like he is in the goddamn moon. If you don't practice a lot, you are liable to fall down to many pitfalls. This game is not that easy. If you want to see the ending or collect/see all the weapons or magic, you might want to play it a few times. 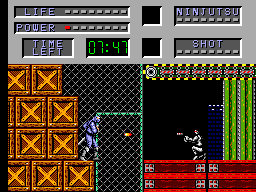 Many consider Cyber Shinobi as the weakest of the Shinobi series. 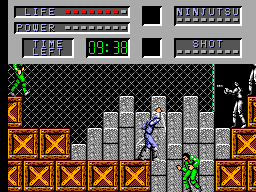 Granted, original shinobi is much better than the Cyber but this game is, in my opinion, is still better than the crap-tastic SMS port of Shadow Dancer. I also accept that there are many problems with the game, namely controls. But this is Shinobi game. Give it a try for the great justice. Believe me, it not that bad.